Create rain sticks in a cost effective manner by recycling old cardboard tubes as part of a multiple literacy approach to Math, Science or Religious Education. This simple art activity based on how to make a Rain Stick was first adapted from The Science Explorer from the Exploratorium, published by Henry Holt & Co. ©1996. An easy to follow step by step instruction list was presented on Exploratorium.edu as part of their Frogs Exhibition. When teaching about South America, teachers may use the musical art activity to encourage the students to explore the musical identity of that country. Maths teachers might use the exercise to guide the students about planning, measuring and creating patterns. Art teachers might become wrapped up in the excitement of creating a design that coils around the musical instrument. This will ensure that it becomes not just the instrument of percussion but also an aesthetic artwork. Originally rain sticks were made from natural materials. The large cactus of the South Americas possessed a wood skeleton that could be hollowed. The thorns were pulled off and later reinserted. They pierced back through soft flesh of the cactus. The cactus would be left to dry in the sun–with the thorns on the inside. Later, the hollow cactus would be filled with small pebbles, and the ends are sealed with pieces of wood. When this was turned upside down the pebbles would emulate the sound of the rain. Skilled artisans could make the stick to sound the way they wanted to. From top to bottom along the spiral seam of the tube, mark out dots about half an inch apart. Pierce the tube with a nail or pin at each dot, being sure not to pierce straight through the tube. Wrap tape around the tube to hold the nails in place. Tape a circle cut to size over one end of the tube so the end of the tube is sealed shut. Place another circle of paper over the open end of the tube, and seal with tape. 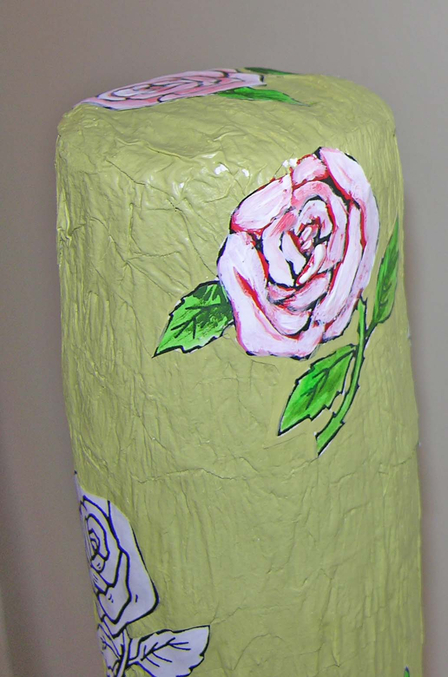 Adorn the instrument by wrapping it in paper mache or plaster bandage. Perhaps rough wrapping could be contrasted by coiling it over a fine smooth sanded finish. Rain Sticks layered with paper mache could be decorated with South American cut pattern designs. In this way students would explore the culture of South America. The Rain Stick may be a musical instrument intended to have a prayerful presence on assembly or at liturgies or on retreat. This aura can be enhanced by decorating the stick with symbolism, colours and finish that reflect the ethos of the school. Look at the many ways that making, decorating and playing a Rain Stick can become a part of the way teachers attend to the needs of students in the class. Aspects such as rhythm and music can appeal to the auditory and kinetic aspect of student learning. Spacing, placing and design of the instrument can appeal to the mathematical intelligence of the class members. Perhaps teachers could use the exercise to introduce a literacy project. Stories children write may be inspired by the making and playing of the instrument. This entry was posted in musical instruments, writing music and tagged arts projects, creative arts education, cultural background, making instruments, music, music lesson, musical instrument, percussion, peru, rain stick, rythum, science lesson on 19/03/2013 by Jo Murphy.